Vampires, werewolves, and angels are popular icons in today’s fiction. New York Times and USA Today bestselling author Kerrelyn Sparks combines them all in her popular Love at Stake series, and now she is bringing them to the annual Romance Readers’ Luncheon sponsored by Heart of Dixie, the north Alabama chapter of RWA. 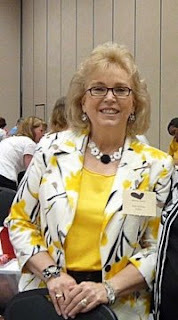 Sparks is the featured speaker for this annual event celebrating romance and literacy in the north Alabama community. Registration is open for the 14th Annual Heart of Dixie event, held at the Von Braun Center in Huntsville, AL, on June 4, 2011, from 11am until 3pm. Special guest author Kerrelyn Sparks will share her vampire world during the keynote speech, host a table, and sign books at this year's event. Attendees will enjoy a delicious garlic-free lunch and blood-stirring conversation with fellow romance readers and favorite romance authors including Linda Howard, Linda Winstead Jones, Lynn Raye Harris, Kimberly Lang, and more. HOD will also honor founding member Beverly Barton. Kerrelyn Sparks’s first paranormal romance, How to Marry a Millionaire Vampire, zoomed out of the bat cave so fast it became the Borders bestselling debut romance of 2005. Each book in the Love at Stake series has become a USA Today bestseller, and the fourth book, The Undead Next Door, landed on the New York Times bestseller list. Ms. Sparks lives in the Greater Houston area with her husband, children, and a house full of garlic, but so far there are no vampires in her family. HOD's Annual Luncheon also includes mysterious door prizes and celebrations. A book fair and autograph session with the attending authors following the luncheon is open and free to the public at 2pm. Profits from the book fair are donated to a local literacy charity. Join us as we celebrate romance in all its spine-tingling forms! Registration is $25 and must be received by May 22nd. Seating is limited, so register today. More information and registration forms can be found at www.heartofdixie.org or call 256-586-5962.